A small-unit module for the Battle Tech universe. Each "stand" represents 4 'mechs, each hex 180 meters, and each turn 1 minute. Combat is both ranges and close, and damage is determined by CRT. Damage is taken in "steps", each unit generally having 4 steps. Exact unit compositions are hidden until sighted. 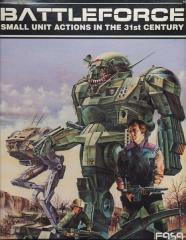 Rules are included for creating custom units using BattleTech constructed 'mechs.